Kokapet is located right next to Gachibowli. Kokapet is home to several high end villa projects quoting 200Lakhs to 350 Lakhs. Once we leave Kokapet, and drive along ORR towards the Mumbai Highway intersection, we hit villages like Vattinagulapalli, Khanapur, Janwada, Mirjaguda etc which are covered in GO111. There is only a part of Tellapur Village, on the Northern side of ORR, which is outside GO111. 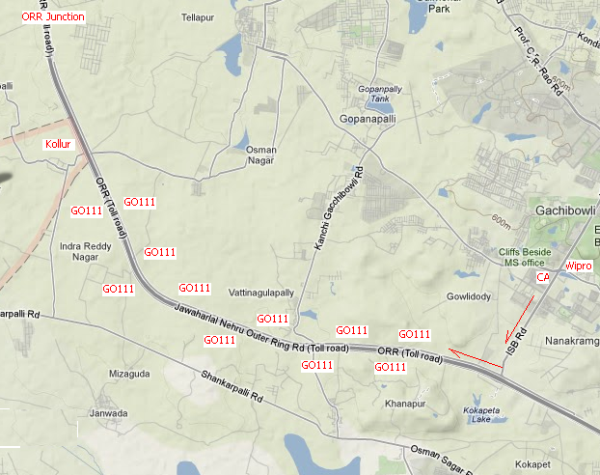 Kollur is 13 Km from Gachibowli Financial District. The entire drive is through the excellent ORR service road. We can zoom to the location in just 10 Minutes from Wipro-Polaris-CA circle. Several Survey numbers in Kollur, Velimala, Edulunagulapalli and <?xml:namespace prefix = st1 ns = "urn:schemas-microsoft-com:office:smarttags" />Pati Villages faces the Outer Ring Road. Its directly connected to Gachibowli Financial District, Kokapet, Gachibowli Signal, Nanakramguda, Narsingi etc through Outer Ring Road and hence has excellent, quick access. There is ORR entry / exit point1 Km ahead of Kollur. While driving from Airport, we can get on to Service road at Puppalaguda intersection and drive to Kollur past Kokapet. The intersection at Kollur (Called Edulunagaluapalli Intersection), is a vital reason for attractiveness of land around Kollur since it gives access to the ORR itself for people around, instead of using service road. Land in Kollur is generally flat and green and this feature continues along ORR in adjacent villages like Velimala & Pati. Kollur has excellent schools like SAMSTHI International School by NCC (http://www.samashti.in) and OPEN MINDS by the Birlas (http://www.openminds.in) People working in Gachibowli Financial District can reach any part of Kollur from offices within 15 Minutes. Kollur is directly connected to Tellapur. Kollur is a classic example of impact of ORR on villages along it. Being close to Gachibowli and outside GO111, has helped Kollur to be one of the first ORR villages to find new age development happening. Several developers have applied to HMDA for approval of Apartment and Villa Projects in Kollur, Edulunagulapalli, Velimala & Pati (all along ORR) . We should soon see large scale construction activity happening here. Projects by Golden Gate Properties and Kondaveedu Developers (Elite Villas) have already commenced development. The physical presence of more than 50,000 employees in Gachibowli Financial District, has created demand for properties in Kokapet and beyond. Being strategically located just outside GO111 area, Kollur and nearby villages along ORR ,are able to attract buyers / investors. As of now, Kollur and adjacent villages like Velimala & Pati offers opportunity to invest in Villas, Apartments and Plots at comparatively lower rates. This location will see large development of Apartment Complexes and Villa Layouts, in future. The projects will be prominent due to positioning along ORR. At presnet, the relatiely low cost here, presents opportunity for investors. You will hear more about Kollur, Velimala, Pati, Edulunagulapalli in future!